Orange County's Best Valentine's Day Dinner! Sushi World is proud to present our specially priced, 7 course Valentine's Day Prix Fixe Menu! Dinner for two will be $95. Reservations will be taken for 5pm till 11pm. Call (714) 828-3474 to make your reservations now! Read more about Orange County's Best Valentine's Day Dinner! Happy Friday! Be safe, be kind, & love one another. In light of all the recent violence taking place in Orange County and all over the world, we'd like to express a very simple message to be safe out there, be kind to one another, and love everyone around you. There's no need to get upset over little things. This world is big enough for all of us to share. Happy Friday, everyone! And when all else fails, eat sushi. :) And be especially careful when playing Pokemon Go. The Red Dragon Roll is a roll within a roll! 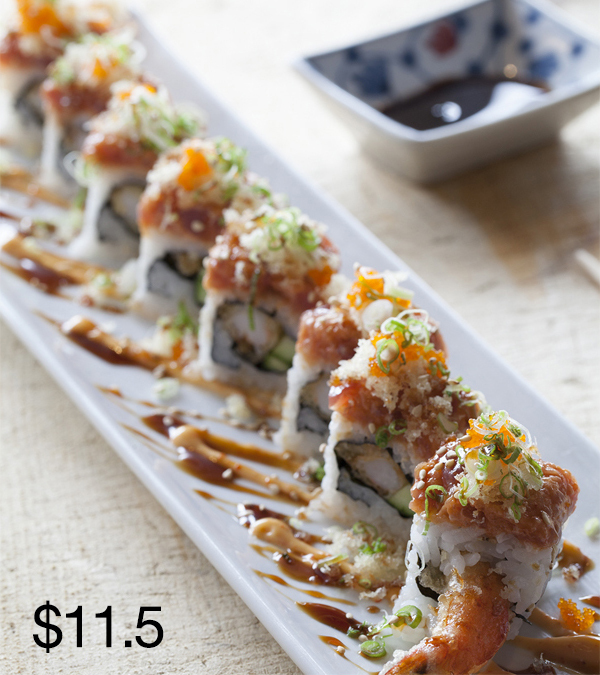 It consists of a center of shrimp tempura roll & cucumber, and is topped with spicy tuna, masago, green onions and finished off with a spicy mayo. The "red" in the name is supposed to make it sound spicy, but it's really not that spicy. Well, not as spicy as a Latina. Can't decide which delicious sushi roll to get? The classic Rainbow Roll has a little bit of everything, tuna, salmon, yellowtail, red snapper and shrimp. Whichever tastes the best to you, order more of that! Come on in! We're open for lunch & dinner! Taco Tuesdays at Sushi World? What the heck? No, we don't have any tacos. But we do have something that is comparable that we're pretty sure you'd enjoy even more: hand rolls! They're small, delicious, you can eat a few of them, and they're healthy for you! What more can you ask for on Taco Tuesdays? Chicken Teriyaki Bento Boxes for Lunch! Can't decide on what to get for lunch again? Sick of fish? Well, you can always get one of our chicken bento boxes! It will surely fill you up because it comes with so much! Check it out by clicking here. It's also great to get for picky eaters like kids or if a person in your group would rather not eat raw fish, then this would be perfect for them to get! Are you ready for an eruption in your mouth? (Wow, that sounds dirty, doesn't it?) Get the Volcano Roll! It consists of a spicy tuna and cucumber in the middle with tempura rock shrimp on top and complemented perfectly with a basil oil. There's no lava gushing out of it. Just plenty of flavor. Our Bentley Roll goes well with the Manhattan Roll. We need to come up with a Parks Place and Boardwalk Rolls. 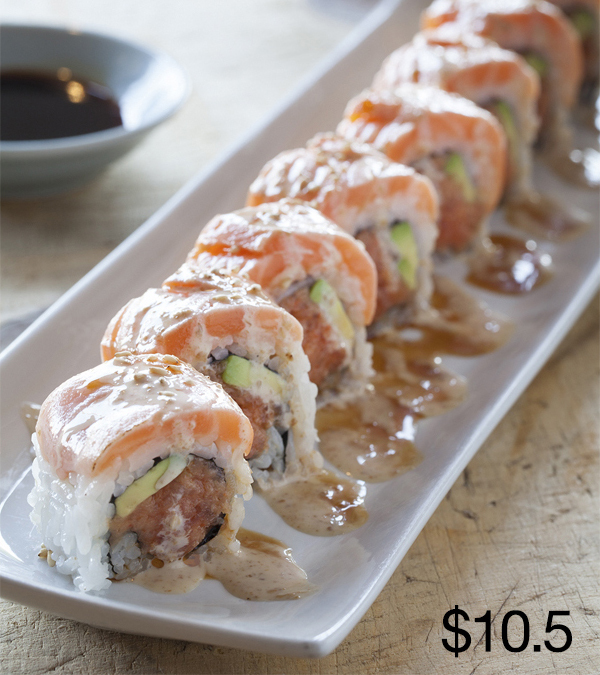 It consists of a center of spicy tuna, avocado and topped with seared salmon, sesame dressing and a sweet sauce. Feels like a Snowman Roll kinda day. It features a delicious center of shrimp tempura, snow crab, avocado & cucumber and it's all rolled together with a sesame seed soy paper. A light sweet sauce finishes it off. You should come on in & try it out for lunch today. Otherwise, it might melt away by tomorrow. Your stomach is growling. For something yummy, for a change. Come on in for lunch and get the Yamaha Roll! 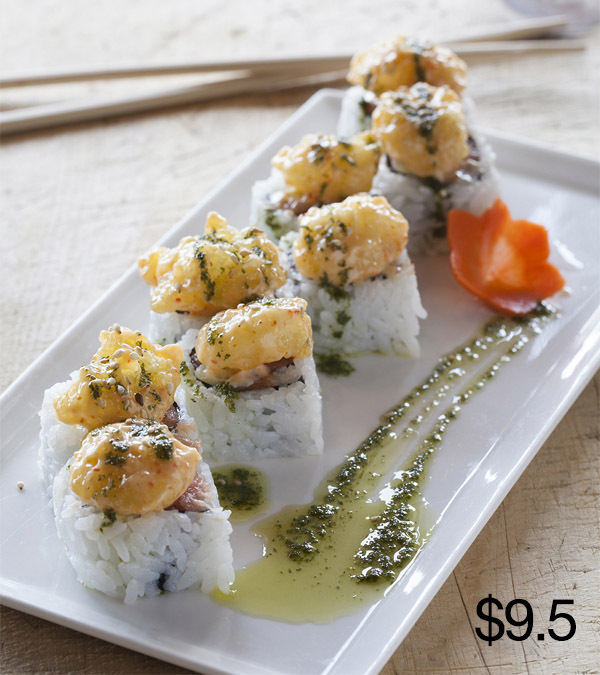 It features a carefully sliced tempura spicy tuna roll with avocado, and dressed with some green onions and garlic ponzu on top. Just give in to that inside voice of yours and come in already.